This is one of the simplest and most delicious of salads. It is especially good in the summer when bright red tomatoes are juicy and flavorful. The essential ingredient is good quality fresh, moist mozzarella. Good fresh cow’s milk mozzarella works just as well. Do not use the yellow plastic-wrapped supermarket variety! Slice the mozzarella in moderate thickness and overlap on a plate with the tomato and onion slices. Then just before serving, drizzle with good quality extra-virgin olive oil and sprinkle with salt and fresh ground pepper. This salad should not sit in oil for any length of time as it will become soggy. Add the oil just before serving! On a large platter, alternate and overlap the tomato slices, mozzarella cheese and onion slices. You’ll love this mildly flavored recipe! Not being a huge fish or sea-food lover, I was amazed with this recipe. It’s so quick, very tasty and surprising with just a couple of simple ingredients. Toast pecans in dry skillet over medium heat, stirring frequently, being careful not to burn them. This will take only a few minutes. Remove from heat and transfer to plate. Place oil in skillet over medium high heat. Spread mustard over one side of each fillet. Dredge each, mustard side down, in pecans. 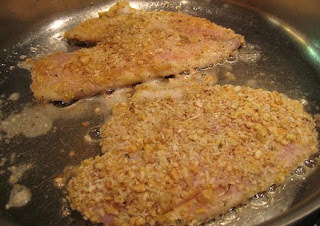 Place fillets, mustard and pecan side up, in skillet. Cook about 4 minutes per side, until fish flakes easily with a fork. When it comes to frosted treats, the cupcake reigns supreme! Do you have a lot of carrots from your garden? This recipe is perfect for using them. These moist cupcakes are delicious, and have all the same luscious goodness of a carrot cake blanketed with a rich, creamy frosting. They're great for a snack, as dessert or for breakfast; in other words, they’re great any time of the day! Place paper liners in 20 muffin cups. In separate bowl stir together flour, baking soda, salt, cinnamon, ginger and cloves. In another bowl, whisk the eggs, sugar and oil until slightly thickened. Fold in the flour mixture until incorporated. Fold in the grated carrots, chopped apple, pecans and raisins. Divide the batter into the 20 muffin cups. Bake about 20 minutes or till a toothpick inserted in the middle of the cupcake comes out clean. Remove from oven and let cool completely on wire racks. Spread cream cheese frosting on cupcakes. Beat butter and cream cheese with mixer until creamy and smooth. Sprinkle chopped pecans on top.